I'm redoing my pasta salad recipes with quinoa. Quinoa and beans are standing in for starch in my summer diet, I still don't feel like eating pasta or bread. More and more of my carbs are coming from vegetables, I actually feel the way about vegetables that I used to about starch. Which let me tell you, did not happen overnight. I halved the amount of dressing from my previous recipe, and it seems fine. But you can also make the marinated beans with 6 Tbsp vinegar and 1/2 cup olive oil and two cans of beans, scoop out about two cups of beans to eat on green salads later in the week, and use whatever beans and vinagrette is left for your quinoa salad. So you only have to make marinated beans once a week, or however fast you're eating them. Measure vinegar into a large bowl and add a generous amount of salt and pepper. (You can kick up the flavor with a little bit of minced aromatics like onion or shallot or garlic; but I'm usually scarfing this down before practice, so I leave it a little bland.) Drizzle the olive oil over the vinegar and whisk it in. Rinse and drain the beans and marinate them in the vinaigrette. Trim and sliver the asparagus very thinly, and drain and slice the artichoke hearts. If you made a double recipe of beans, put away about two cups for green salads. 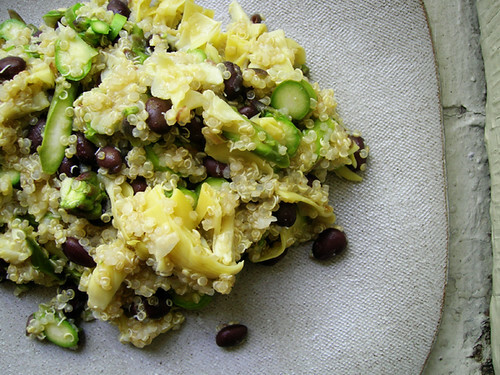 Toss the asparagus and artichoke hearts with the rest of the black beans and vinaigrette. Put the quinoa and water in a pan over high heat. Bring to a boil, lower heat and simmer for fifteen minutes. Remove from heat, fluff it up a bit, and add it to the marinated beans and vegetables. It's very good slightly warm. It's also good cold from the refrigerator, but you might want to wake up the flavor with sriracha or salsa then.